The Cultural Heritage of the former German Region of East Prussia constitutes an integral part of the Polish, Russian and Lithuanian cultural landscape. However, many architectural monuments, including 18th century palaces and parks, were lost or destroyed in wars or through neglect. 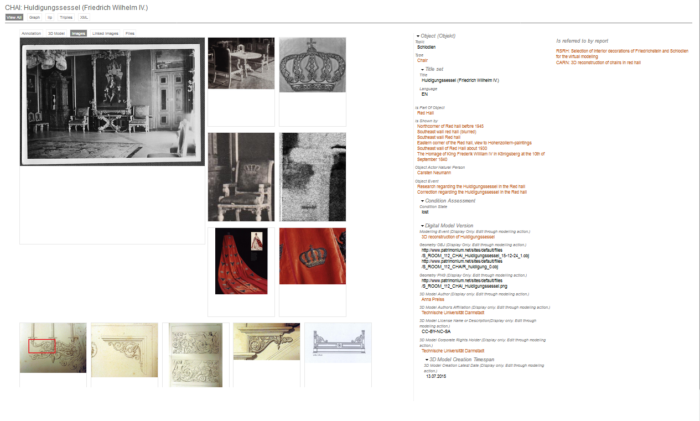 Some twenty years after the political turnarounds of 1989/91, they impose particular requirements on (art) history and architectural history research and documentation. They are at the same time a challenge and an opportunity for the Digital Humanities in the economically and culturally heavily weakened border region of the European Union. The project presented here is concerned with the digital reconstruction of ruins of two baroque palaces: Schlodien, or Gładysze, now in Poland, and Friedrichstein, or Каменка, now in the Russian Federation. Both the geographical and the historical dimension of the research projects suggested a transnational collaboration of experts in the area of architecture, art history, history, information technology and knowledge transfer. Under the lead of the Herder Institute for Historical Research on East Central Europe in Marburg (Germany) the project pulled together a dozen partners from Poland, Russia and Germany and was running between July 2013 and June 2016 funded by the Leibniz Association. The project addresses key issues of digital reconstruction and web-based visualisation of cultural heritage in a scientific research context such as indexing sources, 3D documentation, accessibility and sustainability of digital research data and visualisation of 3D content. Based on multi-source data acquisition the focus is on semantic 3D modelling and interactive data management. A major achievement is the development of a web based platform (patrimonium.net) that collects multifaceted knowledge and activities of a broad interdisciplinary team of experts and offers at the same time an outstanding user experience in form of an easy accessible virtual museum. The project aims to define standards for web-based documentation, processing and presentation of 3D data sets in order to meet general academic requirements. The core element of the project’s result is a platform-independent and internet-accessible virtual research environment (VRE). This VRE is based on WissKi (Wissenschaftliche Kommunikations-Infrastruktur), a scientific communication and information structure that results from a joint venture between University Erlangen-Nuremberg (FAU), Germanisches Nationalmuseum (GNM) and Zoologisches Forschungsmuseum Alexander Koenig (ZFMK). The VRE merges activities of a domain expert (e.g. art historian) and of a 3D modeler (e.g. 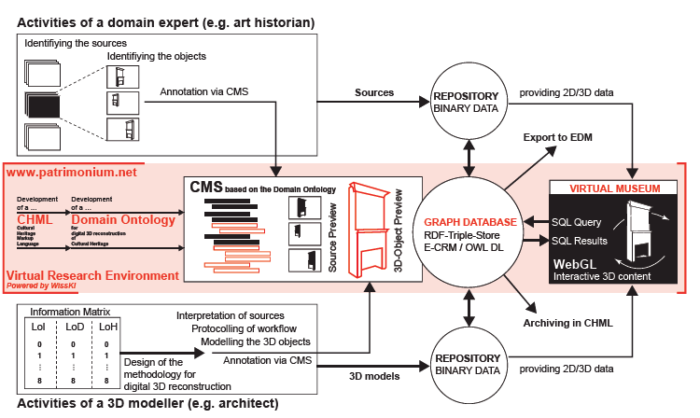 architect) on the basis of a Metadata Schema, the Cultural Heritage Markup Language (CHML) that refers to CIDOC – CRM, and of a domain ontology with controlled vocabularies. All data feed into a graph database that links a repository of 3D models with a repository of source material using RDF Triple Store in OWL DL, and is made available as Linked (Open) Data for the first time ever. This means an important step towards sustainability and interoperability of research data in the field of 3D reconstruction. Annotations linked to 3D objects refer to identification and labeling objects, sources, events, actors, etc., and reveal the authorship, the interpretation of sources, and the modeling and creation process of 3D objects. In the end 3D-objects “tell the story of their own creation”. In addition to the VRE and its semantic 3D modeling a virtual museum was created by integrating 3D-objects into a virtual scenery using WebGL technology that ensures performance, interactivity, and sufficiently realistic and authentic user experience. Techniques from computer games like portalling, hotspots, model splitting and many more proved necessary. 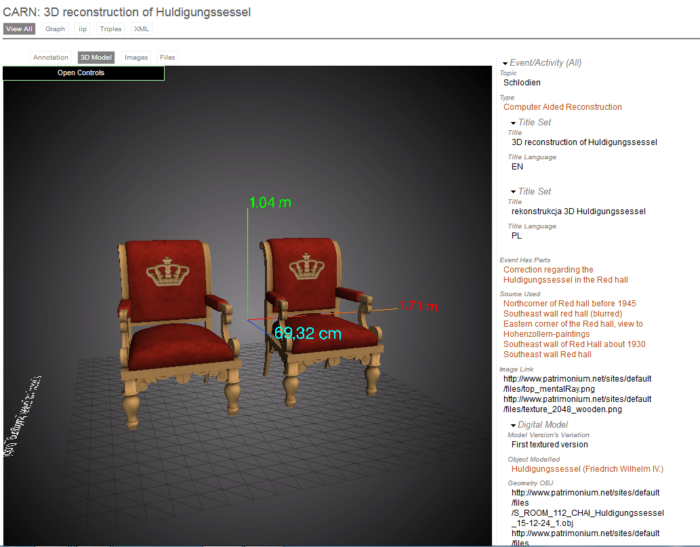 In this paper the 3D reconstruction of two upholstered chairs, called “Huldigungssessel” will be presented as an example. The Huldigungssessel had been used to pay homage to King Frederik William IV in Königsberg (Kaliningrad) in 1840, and later given to Carl zu Dohna-Schlodien, owner of Schlodien palace. The following figure demonstrates the interactive view of the semantic Graph database with all data linked to the 3D reconstruction of the chairs. A closer look at the data shows that the 3D reconstruction of the chairs are mainly based on sources such as black and white photographs taken from the interior of the Red Hall before 1945. In addition other sources were used such as, for example, a colour photograph of the coronation robe of King William’s wife Augusta. 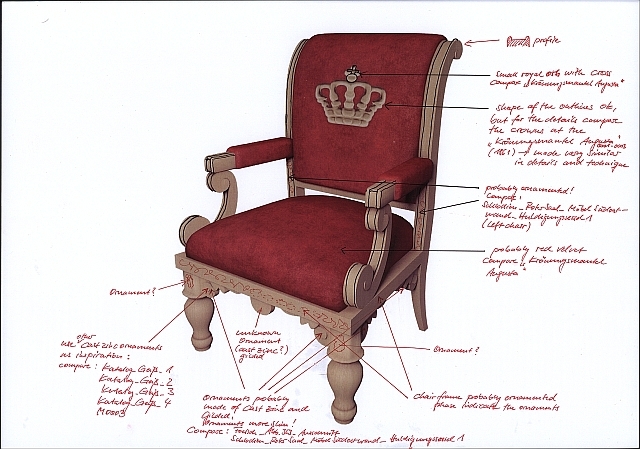 The robe shed light on details of the chair’s backrest that had been embroidered with an imperial crown. Transparency not only with regard to sources used for the 3D reconstruction but also with regard to their interpretation and the modeling process itself is ensured by reports of the researcher’s activities stored retrievable on the database. The following screenshot demonstrates details of the annotations captured in hand written notes. A preview option is integrated into the VRE displaying the 3D-model in context of the data linked to the object. 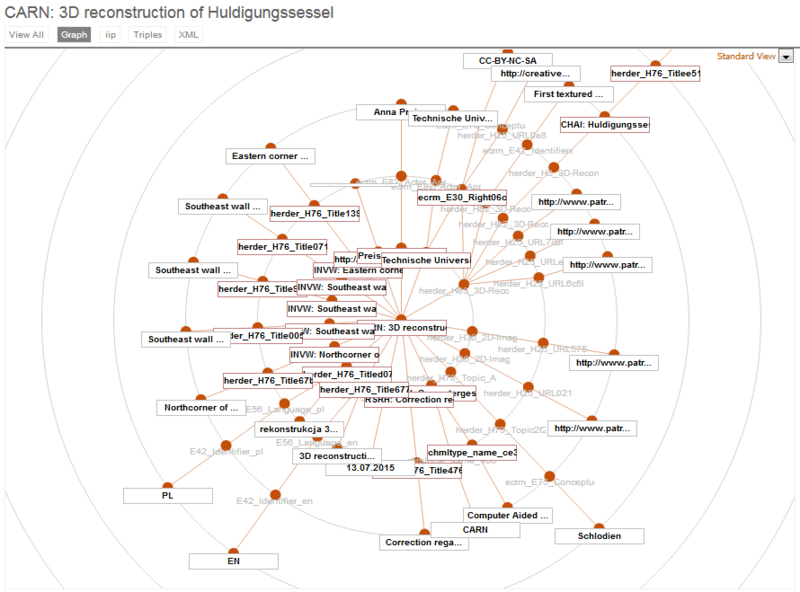 The following screenshot shows the 3D-object “Huldigungssessel” as one entity among others in conjunction with its spatial context, the “Red Hall”. The whole virtual scene is visualized by using web-based technologies and browser tools like WebGL. In this way a self-guided tour through the whole palace of Schlodien and its surroundings are possible within a standard web browser. Comments on individual objects and links to further data of the repository can be accessed by activating click points and icons. 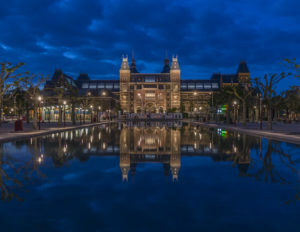 This is one example to illustrate how 3D models and their semantic data are integrated into a virtual reality scene and finally create a virtual museum. 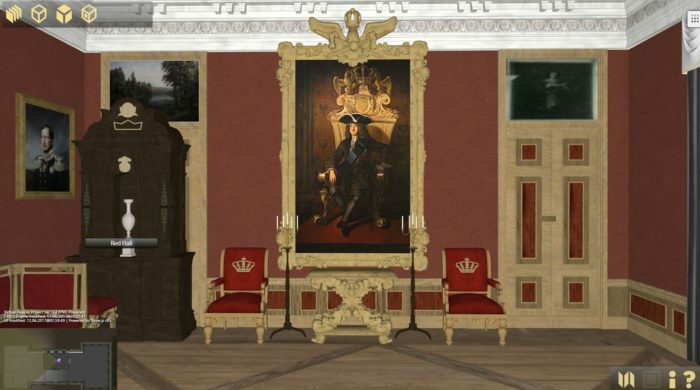 The project “Virtual Reconstructions in Transnational Research Environments – the Web Portal: Palaces and Parks in Former East Prussia” successfully developed a Virtual Research Environment and a Virtual Museum, both of which meet essential conditions for positive future prospects: interoperability and sustainability of 3D data sets. 3D reconstructions resulting from the project are based on a comprehensive documentation of former East Prussian palaces and make non-existing cultural heritage tangible for a broad public. The presentation of this case study introduces the methodological fundamentals, potential and challenges of digital 3D reconstruction, arguing that a scientific methodology and collaborative Web-based research environment are crucial features for this kind of project. Documenting a comprehensive workflow is an essential part of creating a scientific digital reconstruction model, in particular if the 3D modeling is based on CH objects, that exist only in parts or are non-existent any more, as it creates a spatial documenting system that allows for important data analysis and use after the project. The final conference “3D Digital Heritage – Exploring the Virtual Research Space for Art History”, hold in Berlin on June 2017, underlines the impact of the project within the emerging field of the Digital Humanities.